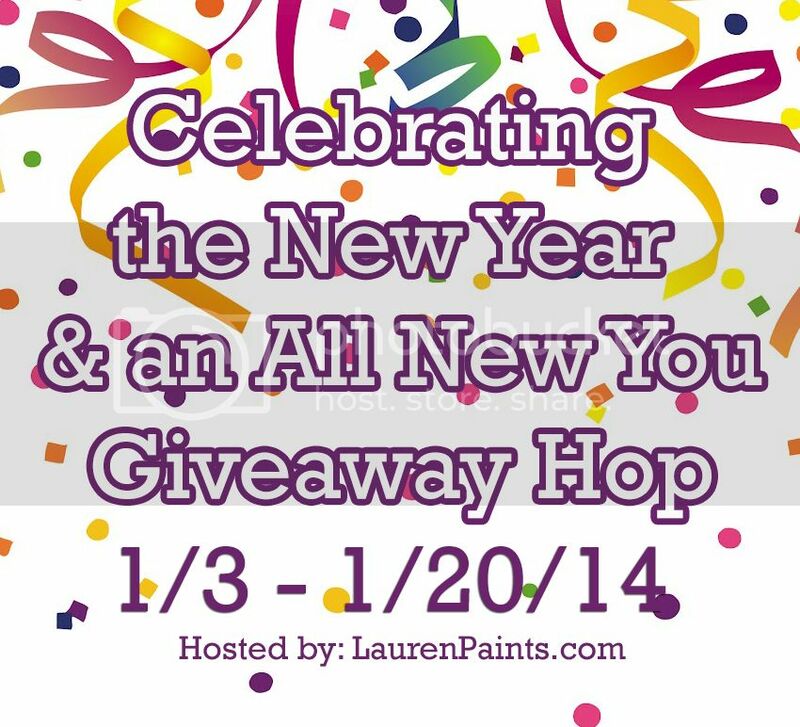 with this giveaway hop hosted by LaurenPaints.com! It's time to celebrate you and everything you are! have the chance to win two great prizes to celebrate! as well as taking on more school credit hours this semester. I also plan on becoming a foster parent this year. for my blog and my personal life! What kind of adventures do you have planned this year? and another will win a $50 Sephora GC! Are you a store or company looking to participate in this Giveaway Hop Event? Contact laurenpaintsflorida@gmail.com to discuss sponsorship opportunities. I want to get a new job, preferably something in my field. I also want to get some of my work published. Going on a family vacation this year. Not sure where, but somewhere. Two things -- take a REAL vacation, for a change, and to finally write the book I've been thinking/talking about forever. Btw, I think your link for your Etsy page is incorrect. It keeps bringing up an error message (it has a period at the end of the name, so maybe that's why?). My resolution is to save more money, I'm looking forward to going on a vacation with my family this Summer. We are going to a beach in July 2014 for vacation. My New Year's goals are to stress less and hopefully lose some weight! I plan on becoming salaried at my job.. I also want to see a ton of concerts. I hope to travel somewhere tropical with my husband this year! I broke my foot on New Year's Day, so my plan is to heal up and hopefully feel better soon! I want to try for another baby and I want to lose weight! My adventures will be adventures of parenting! My goals in 2014 are to organize my house, lose weight, and save $2000. You know, the usual suspects. Nothing planned and no resolutions. My resolution is to spend less and save more. I am travelling to New York and Greece! I am so excited! I want to make summer a vacation time , A cruise , a trip to the beach, and time in a pool! I'll be celebrating 20 yrs of marriage in 2014! The only adventures I have planned is I started a blog on 1/1 and I hope to make it into a place that people will enjoy going to and hopefully make it into a source of income since I cannot work due to back, hip, heart and diabetic issues. Also I hope that my fiance and I make our wedding plans and get married this year. I don't do New Year's resolutions. I'd love to take a trip this year to New Orleans! I don't know if I have any adventures planned just yet, but my main new years resolution is to save money. I am homeschooling this year I don't believe I would be able to tolerate more adventure than that. My New Years resolution is to find a new house and move. No adventure planned other than the adventures that come with having 5 sons. I would like to try to take some more time for myself to do the things that I enjoy that I have not been doing like listening to music and reading. I'm planning a road trip with my best friend. My New Years resolution is to become a vegetarian. I plan on spending more time with my family and eating healthier. My new years resolution is to get my drivers license. in 2010 I was in a bad car accident with my 9mo old thanks to a driver texting wihle driving. almost killed my son and i haven't driven since. But I will get over my fear and I will get my license this year! I want to drink more water and get a six pack. I plan to see more of my home state and I resolve this year to be a better Christian. No big adventures but my goal this year is to become much more organized! new years resolution is go to adkins, go to the gym and develop a routine. I think my adventure will be getting a job and updating my apartment. Thats also my resolution for the year. My adventure will be raising my two month old daughter and watching her grow! Resolution--lose the muffin top! My New Year Resolutions is to have a house! I plan to buy a car, move to a new house and to lose weight! I'm really hoping my husband can get a new job, that we'll find a house, and that I can get (at least somewhat) more organized! new years resolution: to be the best mom i can be! loose weight and be healthier! my resolution is to work out 3x/week! No plans yet but I want to lose 45 pounds and wish that my hubby and I three wishes come true for us. I would love to go on an Anniversary getaway with my husband this summer. I'm sure I will have lots of fun with our children this year too. I might start doing preschool too. One of my resolutions is to continue on my quest to be trim and fit. My goal this year is to get a job and in the process of working get my back finally treat by the pain specialist, continue physical therapy. Be a more active mommy to my three kids, and save up so that I can finally take them to a theme park. I think they really want to go to Legoland since its closer, maybe even the new water park. That is my goal for this year. Nothing planned yet. Hopefully I will heal my injuries. We have more plans to spend time at our little place in Key West & fix it up. I also plan to do another Color Run and hopefully attend a blog conference this summer! My resolution is to get up and exercise a lot more. I'd love to buy a home in 2014. I'm going to Florida for a few weeks and I want to lose weight this year. Then I planning on going out west when my grandchild is born. My resolution is to let go of grudges and to be a better person..I plan to do more crafts this year...Thanks for the giveaway chance. My son received a family year's membership to the Indianapolis Children's Museum for Christmas from my parents so one of my resolutions is to take him as many times as possible! My other resolution is to schedule my first mammogram since I am turning 40 this year! Thanks for the chance to win! I really don't have any big plans and I didn't make any resolutions. I'm taking my final test to become a certified kinder teacher next month..
My resolution is to go gluten free and I'm still going strong. My goal is to swim three times a week. I am very much looking forward to the family reunion we have planned for July. It will be incredible to have all of our family together. I started writing a screen play and a novel over five years ago. I am determined to finish both of them and get them submitted to a producer/publisher. Thank you for the super giveaway opportunity.. Keep up the terrific blogging. I am having baby #2 in March!! I have no adventures planned, and my resolution is to be more organized. My 2014 goal is more play dates for my daughter and to take better care of my self. I realized I put everything I have into being a mom and that I need to take care of myself too. For 2014, I would like to get my bead and painting rooms reorganized. and get more physical activity!! I need to take better care of myself. I have two cruises planned for this year, a Western Caribbean in March and a Panama Canal crossing (Los Angeles to Miami) in October. So lots of adventure on those! I also bought a groupon to go skydiving. We were supposed to go on my birthday (Jan 5) but they were out of appointments the day that we could go, so we will probably go sometime in February. we plan on seeing some more national parks. We we are hoping to visit Disneyland this year to see Cars Land. As for resolutions, I don't have any specifically for this year but just for FROM NOW ON... To remember that every argument for fight or disagreement is the result of the people involved NOT GETTING WHAT THEY WANT. when everyone takes responsibility for their heart, then the disagreement can be resolved. My New Years resolution is to spend less! I have an adventure to California planned here in a few months. We are really looking forward to it! My New Year's resolution is to be more empathetic & accepting of other people. My resolution is to join our local gym, become more active and lose forty pounds. I am subscribed to both emails listed in the giveaway but can not click on the button to confirm that as the big red Pinterest button will not allow me to claim those entries. I have tried refreshing, going around them, quick, slow but it just wont allow it. My resolution is to exercise more! i started this year out in the hospital, so my goal is 'health' first and foremost! We will be seeing some comedy shows. My resolution is to live healthier and happier. We dont have any adventures planned yet but my resolution is to better manage our family's finances. My new years resolution is to start exercising regularly. No planned adventures. No resolutions but rather goals to continue lifting/exercising 5-6 days a week and lose fat and gain muscle.